Ahh, the Apple Blossom Festival. My hometown population grows tenfold, not counting those natives who like to get out of Dodge for the weekend. Steve's first visit here was for The Bloom, after which he commented that Winchester is an interesting mix of rednecks and rich people. That's never more evident than during Apple Blossom. There are concerts, dances, breakfasts, luncheons, 10K, golf tournament, two parades, carnival, circus, midway, craft show, car show, and then all the unofficial private parties. Friday is a local holiday, so schools and business are closed because the traffic situation is tricky and, let's face it, people are mostly thinking about funnel cakes. Everybody wears pink and green, so my mom made this dress for Olivia to wear. (Notice the very expensive box toy that kept her entertained for several minutes: a record.) The festival committee tries to bring in celebrities; this year I'd actually heard of Val Kilmer. Growing up I watched the the parade from the lawn of a family in our church who lives on the parade route (blessing or curse?). During middle & high school I marched with my saxophone and polyester band uniform. I went off to college and then Steve and I lived in PA and DE, but we'd still come for Apple Blossom because it's Winchester's Homecoming. Now that we have a little one it's a little different. The big Saturday parade coincides with naptime, so this year we went to the Friday night Firefighter's Parade instead. There's lots of drama about certain fire companies breaking the rules and blaring their sirens during the parade and subsequently getting suspended from future parades. And for the first half-hour or so it was pretty quiet, but then the sirens started. I plugged Olivia's ears to begin, but then realized she didn't mind the noise at all. She did really great in the backpack, actually. Lots to see and Festival Food to eat: ice cream, corn dogs, gyros, Slurpees... We definitely loved the Firefighter's Parade, although we didn't stick around for the fireworks. The festival has a queen, usually the daughter of a celebrity in hopes that he will come to coronate the queen, and this year it was our governor and his daughter. On Saturday's big parade she rides on a float with a court of princesses and junior princesses and pages and ... Why? I don't know why. Anyway, for the Firefighter's Parade they just had the queen in a convertible, but not just any convertible. 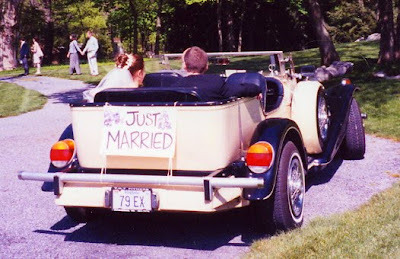 It was the very car we rode in on our wedding day. It's a 1979 Excalibur kit car, but to me it could have been Jay Gatsby's. Anyway, back to The Bloom... Mom and Olivia and I checked out the craft show this year for the first time in a long time and, well, it makes me so glad I don't sell my jewelry at shows. Lots of work and a hot day and this show's crafters are competing with a parade and carnival and circus. Afterward I dropped Mom off to meet Dad at the parade and took OJ home for her nap and to make fruit pizzas. (Does anyone normally eat star fruit? I think God made it just for this.) Then we hung out at the Spences' to watch the end of the parade on TV and eat an awesome dinner. They have cool toys like Matchbox cars, balloons, and a cell phone. Who needs the circus? What fun! Can I just say, once again, that Olivia is such a beautiful little girl? Cheri says she is really friendly too. Good for her. P.S. I really love Olivia's dress. Jim's mom and grandmother sewed for my girls too. I felt so blessed.